“Expecting Sunshine: A Journey of Grief, Healing, and Pregnancy After Loss” by Alexis Marie Chute is an honest look at the myriad of emotions this author experienced through pregnancy, loss and pregnancy again. The raw details of her life are put on display in this book, which can bring healing for her, and hope for others in a similar situation. The author brings to life her year of distraction in haunting detail as she relives in her mind all the pain, fear and sadness she experienced when her once happy pregnancy turned dark. Towards the end of her pregnancy with her soon-to-be second child, Zachary, it was discovered that he had a genetic disorder and that he would not survive from past birth. Clinging to a sliver of hope that a miracle would occur, Ms. Chute, with her husband, had daily trips to the doctor until Zachary was born. Not long after his birth, he passed on, leaving the hearts of Mr. and Mrs. Chute empty. This book focuses on the heartbreak and healing that takes place after Zachary’s birth. About a year after losing Zachary, Ms. Chute gets pregnant again. The fears and anxiety she experiences mirrors the intensity of a PTSD victim. While the reader is drawn into her pain, her honesty about her feelings provides a sense of comfort as well. She faces those feelings head on, and even offers help to another who is experiencing a similar loss. 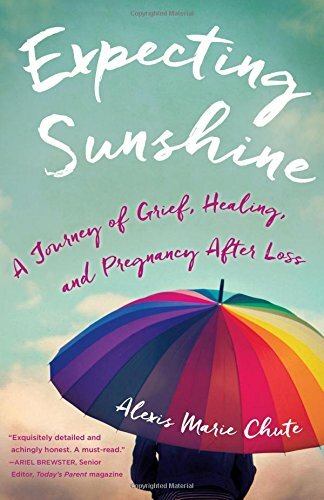 I highly recommend “Expecting Sunshine: A Journey of Grief, Healing, and Pregnancy After Loss” by Alexis Marie Chute to anyone who has suffered the loss of a child, or any loss that leaves a hole so large, it seems impossible to ever feel whole again. While I don’t have any children, I could feel the author’s pain and celebrate her successes. This book will provide immense support and healing for those in similar situations. Ms. Chute’s writing is beautiful and she reminds us all that hope is alive!